Congratulations to Michelle and Robert! Michelle was looking for a custom hand painted runner featuring their unique monogram. Their colors are amazing and just pop off of the delicate white french lace runner. It is really beautiful! If you are in interested in a custom runner please contact us. We have monograms available to choose from or you can send us yours. Congratulations to our bride getting married this weekend! We wish you a lifetime of love and happiness! 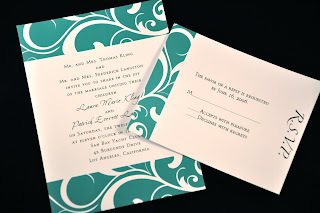 All of our event stationery is completely customizable and we'll work within your budget. We are brides ourselves so we know how important it is to not go over what you're set to spend. We'll make you fabulous invitations and matching stationery for amazing prices! Email us or call (732) 284-3745 for a free consultation. Become a fan on Facebook! Help us reach 300! You can also follow our tweets on Twitter! Congratulations to Stefanie and Matthew. Stefanie wanted a tiffany blue monogram so we went with Patina paint. It came out gorgeous. If you would like a monogram painted for your event, please contact us! These are just the digital mock ups. The final products will be fabulous. Pics to follow soon! 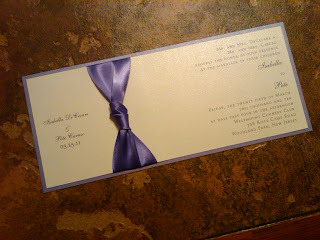 Take a look at the lovely new addition to our customized wedding invitations. We call it the Laura and we love her :) Isn't she pretty? 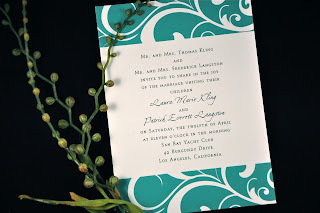 The Laura is printed on 100# linen card stock and is 5 x 7 and she comes with a matching 4 x 5 RSVP card. We have samples waiting to be bought and loved so visit our website and order today! Samples will be shipped same day. The winner of our 50 free save the dates is Michelle F. getting married on 3/4/11! Congrats Michelle! We'll contact you via email to give you the great news. A number was chosen at random using random.org and that lucky number was 14. Dana and I attended the American Bride Bridal Expo at the Raritan Center Expo Center in Edison, NJ yesterday and it was great. You can find photos of the event on our Facebook page. All the vendors were amazing and my wedding photographer was even there, Artist European. I love them so much. They're work is just out of this world and they are great people on top of that. Gerda, Ed, Barbara...so great to see you! It was wonderful to meet all of the brides & grooms. We hope to hear from you soon! We will also be announcing the winner of our giveaway this evening!